You can use it to manage a charity - remember to register it with the Charities Regulatory Authority. 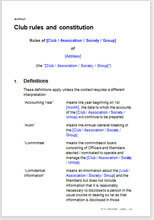 It is a good idea to draw up a written constitution outlining the aims, activities and rules for running your group. Of course you want to be sure that the constitution covers everything you need, but does not go over the top in an unnecessarily long document. The usual extensive and invaluable explanatory notes and guidance.